Musings On Iraq refined its statistics to just cover those incidents most likely committed by the Islamic State. The data showed a brief surge of violence in the spring, followed by a plateau during summer to fall, and then a large drop in the winter. 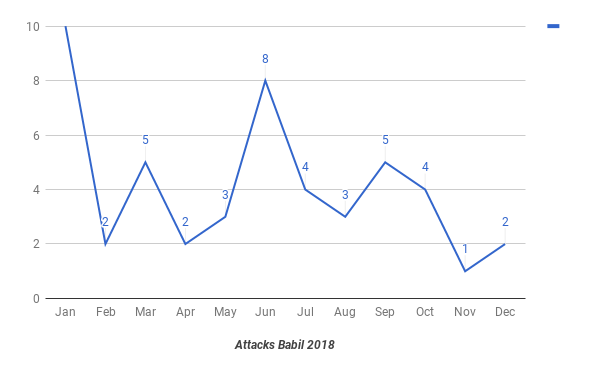 Overall, there was a steady decline in attacks from the start to finish of 2018. 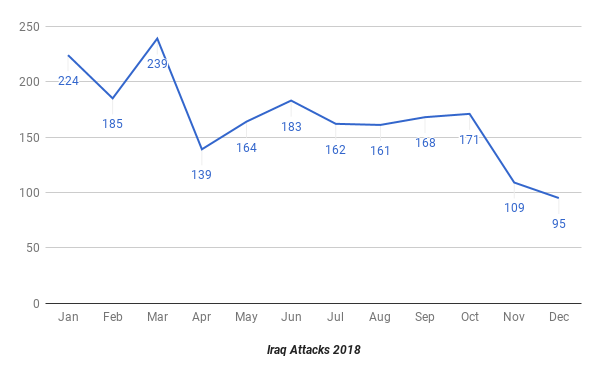 Iraq witnessed a roughly 60% decline in the number of security incidents from January to December 2019. At the start of the year there were 224 incidents. 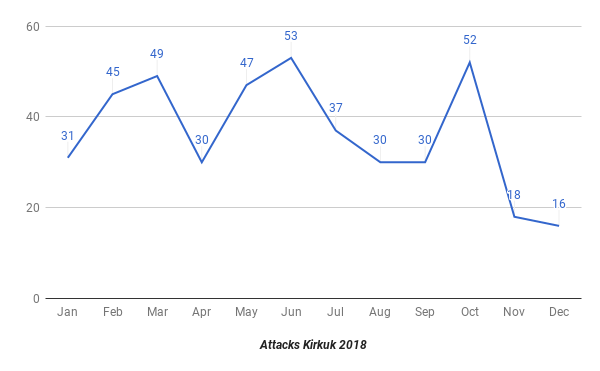 In March, there was an uptick to 239 incidents led by increases in Anbar, Diyala, Kirkuk and Salahaddin, before dropping to 139 the next month. Violence then increased and flatlined from June to October. 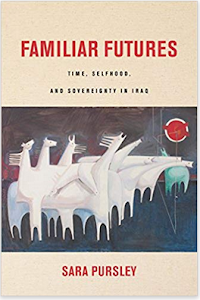 That started in Diyala and Kirkuk in June, then shifted to Ninewa for the rest of the summer, and then finished in Anbar, Baghdad, Kirkuk and Ninewa in the fall. 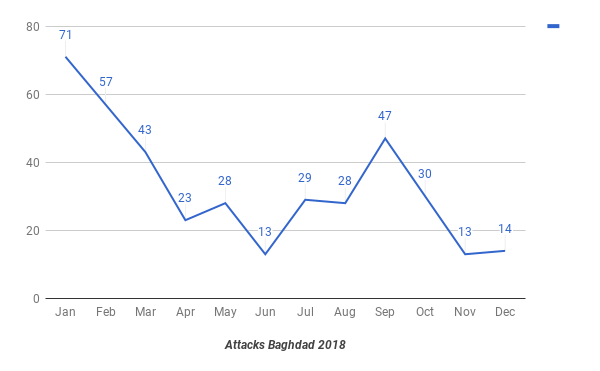 During the last two months of the year there were some of the fewest incidents ever recorded in the country as the Islamic State largely withdrew from the battlefield. The pattern of mass casualty bombings followed its own pattern. In January there were 13 including 7 suicide bombings with one in Baghdad and 6 car bombs. That went down to 4 in February and 3 in March before rising to 5 in April and 8 in May. All the attacks in May were suicide bombings including one in Baghdad. They then declined and rose once more to 8 in September before going down once again to just 1 in December. Throughout the year IS showed the ability to penetrate security around major cities. 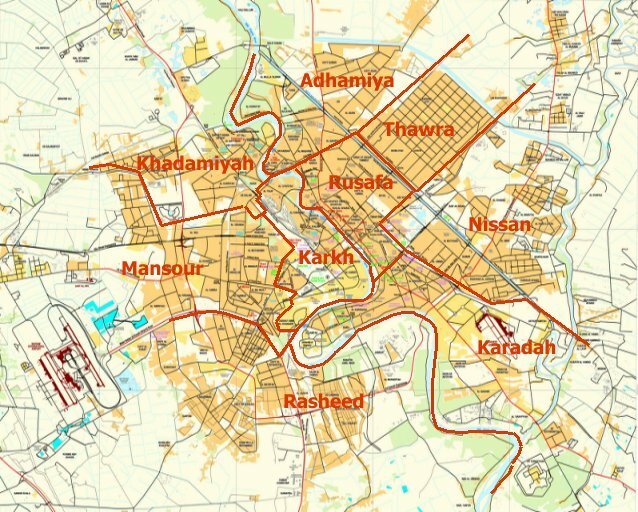 In January, Baghdad was hit by a suicide bomber. 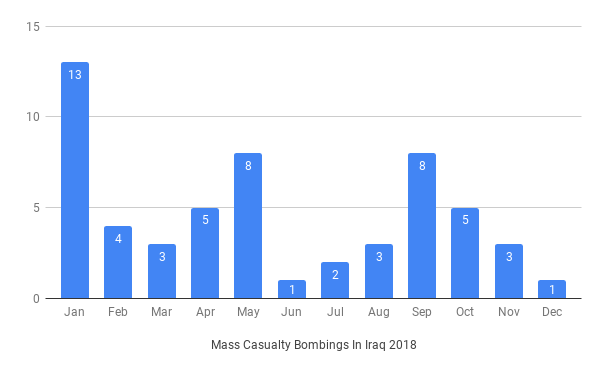 Ramadi was bombed in February, Kirkuk in March and April, Baghdad again in May, Tikrit in June and July and Kirkuk in that last month, followed by Fallujah and Kirkuk in October, and finally Mosul and Tikrit in November. The insurgents have withdrawn to rural areas, but still maintain some networks into urban cores. This is important because to remain relevant and expand its finances the group has to return to Iraq’s major cities, especially Baghdad. 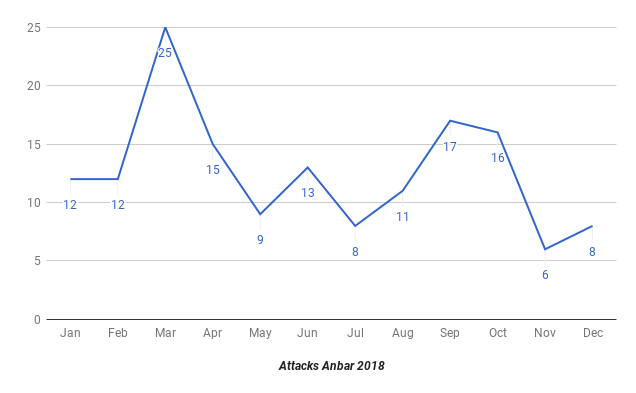 The insurgents largely withdrew from Anbar in 2018. There was an average of only 12 incidents a month there during the year. Attacks started at that amount in January before they doubled to 25 in March. Violence then fell off before increasing again from August to September rising to 17 that month. That coincided with two suicide bombers in Haditha and Qaim in the west. October had 16 incidents including a suicide and car bomb in Amiriya Fallujah and Fallujah respectively. The year finished with 6 in November and 8 in December. 90% of incidents in Anbar are low level shootings and IEDs. There were very few confrontations with the security forces or attacks upon checkpoints. 6 mukhtars were targeted, which is a sign of attempting to take control of towns. 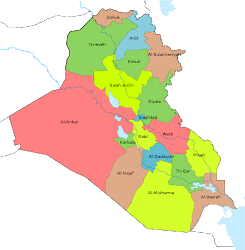 There were 10 suicide and car bombings in the province however, which was the third highest in Iraq. IS used to have a presence in all the main cities, and were active along the Syrian border moving its forces back and forth. 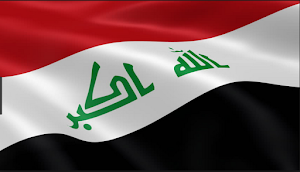 Concerns about the border continued, but IS focused upon other areas of Iraq. Northeast Babil was once a major base for the Islamic State, but after a large forced displacement by the Hashd the militants only made forays into the governorate in 2018. There were 10 incidents in January, the highest amount of the year, before dropping off to just 2-3 in February, April and May. That rose to 8 in June, but then declined once again with just 1 incident in November and 2 in December. Almost all these attacks remained in the northeast along the border with Anbar. The Hashd emptied the Jurf al-Sakhr district of people when it was cleared in 2015 and have not allowed any to return since then, and then made forcible removals in Musayib to the south in 2017 as well. This was done to protect the pilgrimage routes from central and northern Iraq to Karbala and Najaf, and largely broke up IS’s presence in the province as the low level of activity showed. 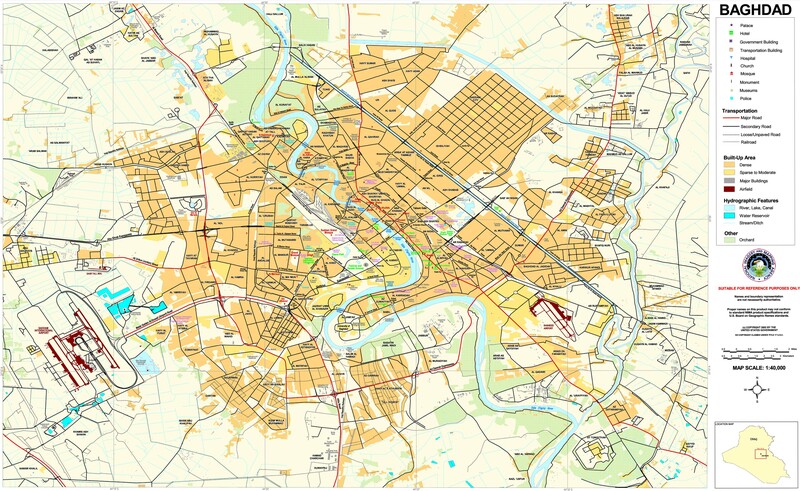 Baghdad was another area that went from a major target to a sideshow. At the start of the year there were 71 incidents in January going down after that to a low of 13 in June. Incidents went back up reaching 47 in September, before hitting the teens in the last two months of the year. While there were an average of 33 incidents there a month, the third most in the country, that figure spread out over the size of the province made little overall impact. Almost all the attacks are small as well such as shootings and IEDs. They also occur mostly in the towns in the outer north and south, and to a lesser degree in the west. 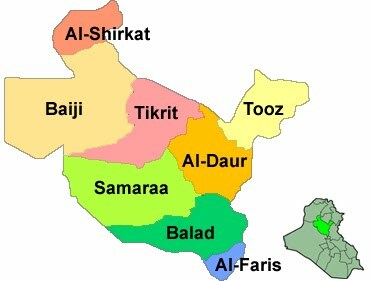 The Baghdad Operations Command has focused upon these areas known as the Baghdad Belts, and has contributed to the massive drop in violence in the capital. The province was once a main priority for IS because attacks there challenged the authority of the government, and provided large civilian gatherings to be bombed. 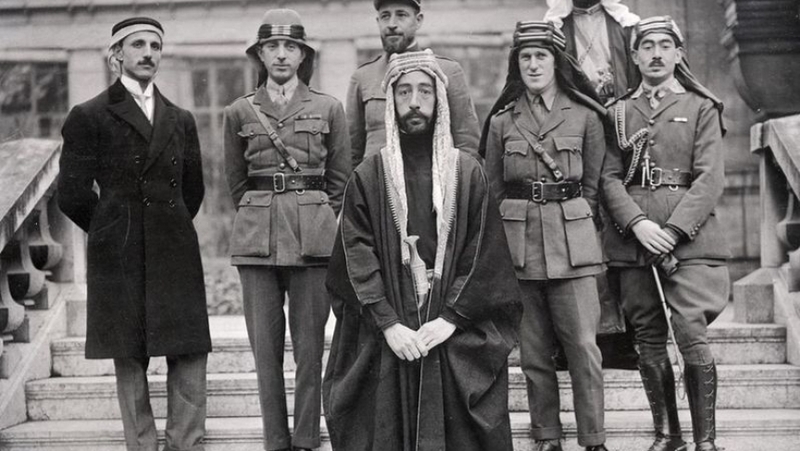 Baghdad was also an important source of revenue that IS has tapped into in the past extorting money from businesses, construction projects, and trade. That is no longer the case. 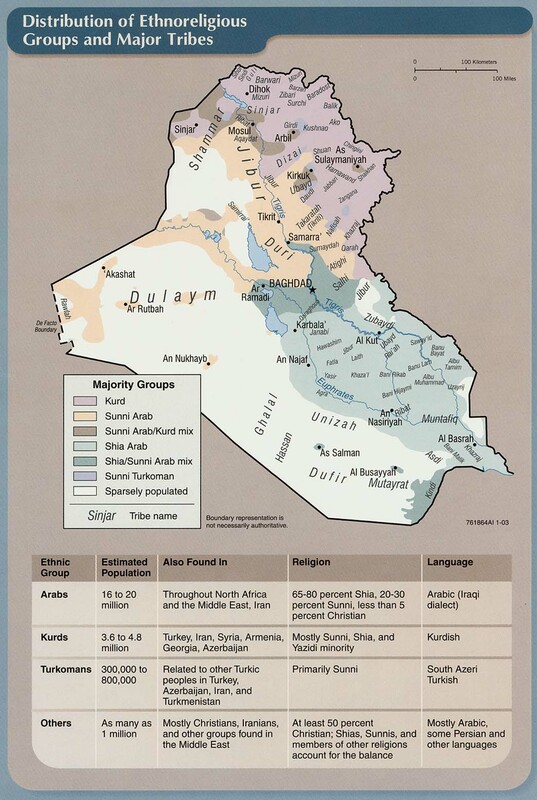 Diyala was the first place IS switched from conventional fighting to an insurgency. That was because it never seized any major areas there in 2014, which meant it maintained a guerrilla warfare strategy. By 2018 it was active in every single rural area, and moved back and forth into neighboring Salahaddin. In March and June attacks shot up to 54 and 51 respectively, but for the rest of the year there were around 30 incidents per month. The types of attacks showed that IS was determined to assert its power there. Every month there were gun battles with the security forces and assaults upon checkpoints. More importantly 25 towns were attacked, along with a steady diet of kidnappings and mukhtars being targeted. This focus upon the countryside was also shown by the fact that there were only 4 mass casualty bombings in Diyala in 2018. IS also took advantage of the federal government taking over the disputed territories in the northeast after the Kurdish referendum. There are now multiple security forces working there that don’t coordinate and don't deploy enough forces either offering ample space for IS to operate in. Kirkuk was another base for IS. It hardly put up a fight when the Hawija district in the south was cleared in 2017, retreating and saving its manpower rather than confronting the Iraqi forces. That area along with neighboring Riyad and Dibis in the north all have strong insurgent presences today. 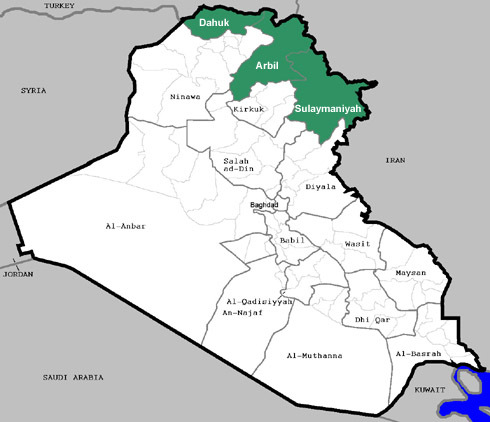 Like Diyala, the militants have expanded into Kirkuk city after the central government took over from the Kurds. That is the only major urban area that IS has been able to consistently operate within. 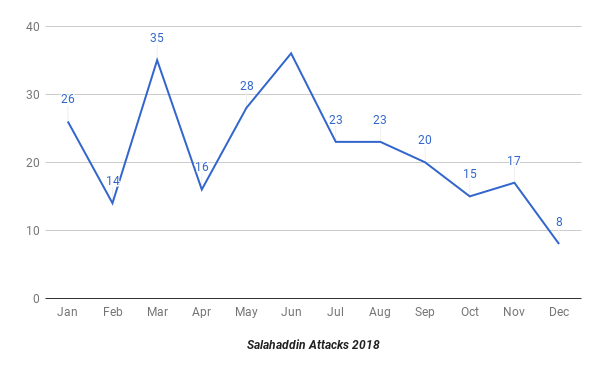 There were three main surges of IS activity in the province in March, June and October, but in the winter it largely withdrew with only 18 incidents in November and 16 in December compared to an average of 36 per month for the year. 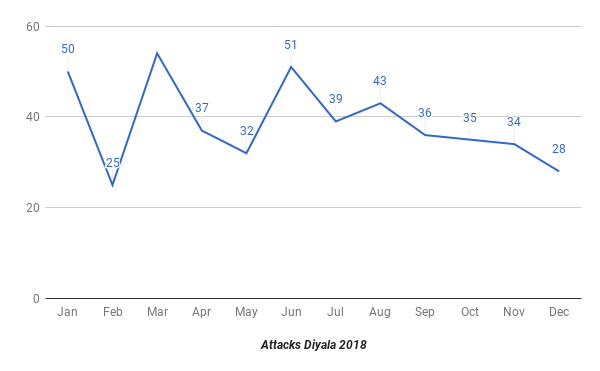 Again, similar to Diyala there was a steady pattern of shoot outs with the security forces, attacks on checkpoints and mukhtars, kidnappings, and 29 towns assaulted. There were also 15 mass casualty bombings there, the most of any province during the year. Southern Ninewa is the third main support area for the Islamic State. There were an average of 20 incidents per month in the province. From February to March and July to August there were two short jumps in attacks along with a large dip down to just 9 in June. There was a steady number of shootings with the security forces, especially during the first half of the year. The group didn’t start attacking towns until the end of the year, which also coincided with 4 suicide-car bombings. IS had a strong presence in northern and central Salahaddin, but then seemingly withdrew in the second half of the year. 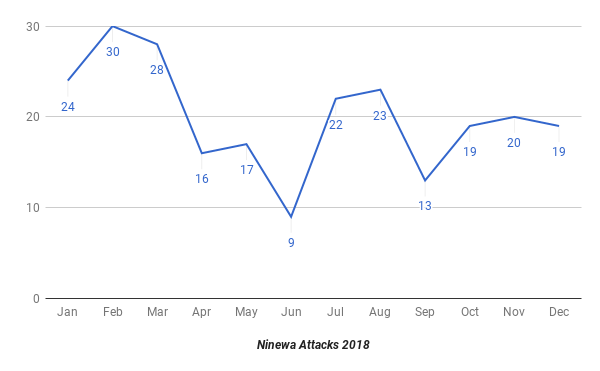 In March and June there were two increases in attacks to 35 and 36 respectively, but then went down afterward steadily finishing with 8 in December. Likewise, there were more gun battles and kidnappings in the first six months of the year compared to the second. There was a total of 14 suicide-car bombings in the province, which occurred ten out of twelve months showing that the insurgents wanted to make its presence felt consistently. There are no clues as to why IS shifted away from the governorate. The Islamic State was able to quickly reorganize after losing its last bits of territory in Iraq. It has safe bases in the center of the country, and routes into many of the country’s main cities. 2019 could be the year IS tries to expand. That could take the form of a higher rate of activity in Anbar and Salahaddin along with more mass casualty bombings. The ultimate goal will be moving back into urban cores. This will be a major test for the Iraqi forces, which have had successes in some areas like Baghdad, but have been completely ineffective in rural areas. The U.S. led Coalition is attempting to train the government’s forces in counterinsurgency, but it suffers from major institutional shortcomings. That means they will likely continue to struggle in the countryside, but have to put up a fight in the cities.